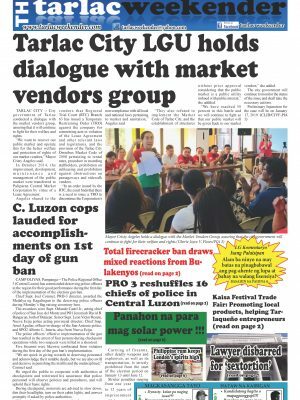 CITY OF SAN FERNANDO, Pampanga — The People’s Republic of China (PRC) donated on Tuesday some PHP7.7 million to the Pampanga provincial government to help the province protect its poultry sector that suffered hard on the heels of the first bird flu outbreak last August in San Luis town. Chinese Ambassador to the Philippines Zhao Jianhua handed the check donation to Governor Lilia Pineda and Pampanga Second District Representative Gloria Macapagal-Arroyo in rites held at the PRC Embassy in Makati City. The handover ceremony was witnessed by San Luis Mayor Venancio Macapagal and Provincial Board Members Rosve Henson, Anthony Joseph Torres, Fritzie David-Dizon and Cherry Manalo, provincial veterinarian Augusto Baluyut and provincial disaster risk reduction and management officer Angie Blanco. The Chinese ambassador congratulated the provincial government of Pampanga for being able to immediately control the bird flu outbreak, which was declared by Agriculture Secretary Emmanuel Piñol on August 11. On August 28, President Rodrigo Duterte said the problem was over, with assurance that poultry products from Pampanga and Nueva Ecija, including eggs, were safe to eat. The Pampanga poultry sector suffered losses of PHP192 million due to the bird flu outbreak with more than 420,000 chickens, ducks and quails culled. “Please regard this as a token of friendship that has lasted thousands of years,” the ambassador said, adding that relationship between the two countries was consolidated when Arroyo was President. “China is not only a friend of the Philippines. China is also a friend of Pampanga,” he said. In her acceptance remarks, Pineda thanked Arroyo for helping facilitate the donation. The governor said the donation would be used to buy and operate a mobile laboratory to test and confirm avian influenza strains. She said the funds would also be used to improve capabilities to regulate and monitor the local poultry sector.